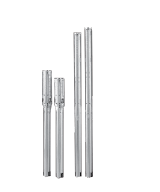 The Grundfos SQFlex is an industry-leading submersible pump for water lifts of up to 800′. SQFlex pumps can be directly powered by solar or wind or can be run on an inverter, generator, battery, utility grid, or any combination of these sources. Virtually any source of power, 30 to 300 VDC and 90 to 240 VAC, can be used to run this pump.